The writer known for creating Howard the Duck and much more died on 10th February 2008. Steve and others of his generation brought much needed new ideas to Marvel Comics in the 1970s. I’ve just been re-reading his run on The Defenders and Nevada along with his current Dr Fate comics. As an early adopter of computers and the internet he had often corresponded with fans on various forums. Over the last year or so I had visited his blog daily where he sadly described his worsening health among many other subjects. It is quite moving to read the numerous comments posted there both before and since his death. Currently his Weblog is available here. The following letter was addressed to the Comics Magazine Association of America, the administrators of the Comics Code Authority. The CMAA forwarded it to Marvin Wolfman, then editor-in-chief of Marvel Comics, who passed it along to me. I found it both delightful and gratifying—a validation of everything I hoped to accomplish with Howard the Duck.For those prone to doubt: yes, this letter is absolutely real, and complete except for the author’s last name, which I’ve elected to withhold. I’m pleased to be able to share it with the world at last. 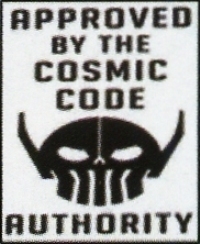 It is my understanding that you are the aprovers, as per the cover seal bearing your identification, of the comics produced by the company known as Marvel Comics. If this is, indeed, the case, I would like to point out to you something that may have slipped your notice. I am referring to a magazine called HOWARD THE DUCK #2, MARCH, produced and sold by the above-named comic magazine producers. This is, as far as I have been able to ascertain, the ONLY magazine available regularly that features talking animals of the Disney ilk, and, as such, it provides immediate gratification to a group of consumers who dote on this form of entertainment and who, through lack of alternatives, will purchase THIS magazine before all others of the super-hero, war, mystery variety– I am referring to very young readers. But, once purchased, this magazine becomes a pseudo-sexual, liberal, pseudo-intellectual pretense obviously written by an over-sexed manic depressive. For the first seven pages, the talking animal of the book is seen smoking cigars and sharing a bed with a scantily dressed and well-endowed young woman, discussing their “hang ups”. Later in the book, the duck, called Howard, is accosted on a bus by a woman who admonishes him to live clean, eat right and live morally…then this woman is shown as a toothless, raving fanatic that Howard immediately feels compelled to strangle, thus assuring little children that might shall conquer over goodness and righteousness and that the latter two are a sham, a mockery foisted upon the earth by diseased, fanatical, stricken human beings. Later in the book, Howard’s companion, now dressed a little bit further, after having been reunited with her “human” boyfriend who has been assumed control over by an extraterrestrial turnip, asks said boyfriend if…when he attempts to proposition her…he thinks he can “…sustain a level of AROUSAL?” This is a quote…in a magazine sold to children! The “turnip” also refers to it’s [sic] human host as “meat”…which, while I’m not sure what the harm is in this, hardly seems necessary for, again, the readers of this magazine who, again, I am sure will be, for the most part, children. I call this to your attention, without including my address, because I do not wish to be bothered answering counter-charges of any sort, because, as guardians of the morality of magazines sold to children, I feel you have been grossly derelict in your duties as set down in your code booklet, and I feel justified in asking that you either correct these errors in the future, or remove your name from the magazine’s covers, so that educators, etc., will not be fooled into purchasing and distributing such garbage to their students, and so that parents will feel that they are being dealt with honestly. Only when a writer has been called a liberal, pseudo-intellectual, oversexed manic-depressive can he be sure he’s fighting the good fight. I think this panel is an appropriate way to finish.